After the first Ruby which comprised a series of 14 tracks unearthed in the 94 and 95 years, “Ruby Two” concludes this era with two tracks pulled from what was left of the albums Tales from Arabia in 1995 and Space released in 1994. 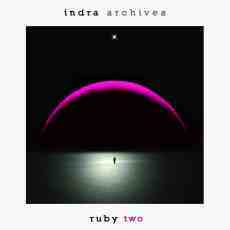 Afterward, “Ruby Two” does a big jump in time with 6 tracks composed at the same time Echo in Time, one of the first official CD of Indra which saw the light of day in 1998, which were lost in the numerous recordings and which covered the vaults of the Rumanian synthesist. Contrary to Ruby One, this 2nd part of the gigantic Archives series offers a better sound quality, set apart the percussions which resound too hardly in the delicious "Equilibrium", and brings us literally where Indra has began little by little to charm the senses of the fans of a minimalist EM which was soaked by the perfumes of Klaus Schulze, periods Angst to Miditerranean Pads. I adored it because, and this as in every album of Indra, hides a pearl or two which put a smile, and in our ears, our senses and our soul. And that begins with "Maya", taken from the Tales from Arabia album. Already we feel the beginnings of the Indra signature with a minimalist movement of sequences which zigzags smoothly and subtlety, and where are adding chords of synth which are dressed in tones of Mediterranean guitars. Layers of synths misted of mists and of astral choruses assure the portion of atmospheres while these chords of false guitar manage the portion of harmonies. That reminds me of a conquistador playing guitar on the back of a donkey. Mesmerizing and magnetizing, even adorned with this old sound envelope, "Maya" is the front door of a universe which we did not know so spiritual of Indra. "The Deep (Excerpt)" is one of the rare recoverable sound fragments of the Space album. It's an ambient track with beautiful orchestrations which are shaken by percussions armed of arrhythmic hits. Violins, synth layers and chirpings as well as these choruses, that we guess hardly, plunge us into a universe of blurry meditation. Then we fall in the unreleased pieces of music with the very beautiful "A Walk in the Clouds" and, believe me, the title carries its intensions marvelously. At the very beginning, the movement of sequences is furtive with uncertain steps which sculpt the walking of a duck on clouds stigmatized by iridescent colors. Shaped in a bluish smoke, the harmonies are divine even if ambient. The architect of sounds from Romania adds these percussions with beats so disordered, as well as glass sequences which clink over the pulsations of these steps which are now more lively, faster. It's a short accelerating phase where the synths moan superbly in a mosaic of sounds and tones which will take back the lame step of its introduction but enriched by organic tones, one would really believe to hear a duck cackling, and of these perpetual caresses of violin which give so much depth to the music of Indra. These weeping violins lead us to the skies with the very beautiful morphic lullaby which is "Living on a Rainbow". This is another track that I would love to hear in a version totally redone by Indra. Very beautiful! The piano tears away the tears of my soul. The limitations of the recording sources are even more omnipresent in "Equilibrium". The ringings and especially these disjointed percussions which fill the meditative atmospheres of Indra, as well as certain felted explosions (are they always percussions?) annoy a little the hearing. At this level, the very ambiospherical "Ancestor's Legacy" would have clearly a more impact here. But why putting such a piece if the tone is so much lacking? Because it is a pure jewel! The cosmic lullaby which gravitates like if we took up a spiral staircase towards the sky is simply divine. The arrangements are of silk. And the finale! Simply divine with its fluid and lively movement of sequences which seem to run such as an army of small step in a labyrinth decorated with mini loudspeakers which spread layers of smoke and of vampiric harmonies. Magnetizing New Berlin School! And that breaks me the heart to know that a so brilliant piece of EM is lost in a so limited sound envelope. "Oldie but Goldie" is another interesting track of which the intro seemed has nothing really fascinating to offer. That starts rather slowly with layers of synth in contrasting forms. One would believe to hear singings of whales which are dying on the ice floes of cosmos. Heterogeneous noises and scattered percussions, as well as their shadows and the echo of these shadows, try to shape an ambient rhythm which accompanies the singings of a nasal synth. Little by little this movement rather unorthodox takes shape with more harmonious sequences which clink in the furrows of more and more lively percussions. Sequences and percussions adjust their paces and bring "Oldie but Goldie" towards a heavier and more dynamic but still slow tempo. Doubtless written in the ashes and the atmospheres of "Oldie but Goldie", "In the Army" offers a structure brilliantly more livened up with a good play of sequences and percussions where burst beautiful sound effects and comes a superb melody weaver of earworm. From the last 7 minutes of "Equilibrium" we are in a universe which deserves amply the money spent of this “Ruby Two”. In a universe unique to Indra who deserves certainly his musical alliance to Klaus Schulze. There is some great musical moments here. And to date, the exploration of the Ruby's first two sonic chapters are up to my expectations. I'll dive into Ruby Three in next week.